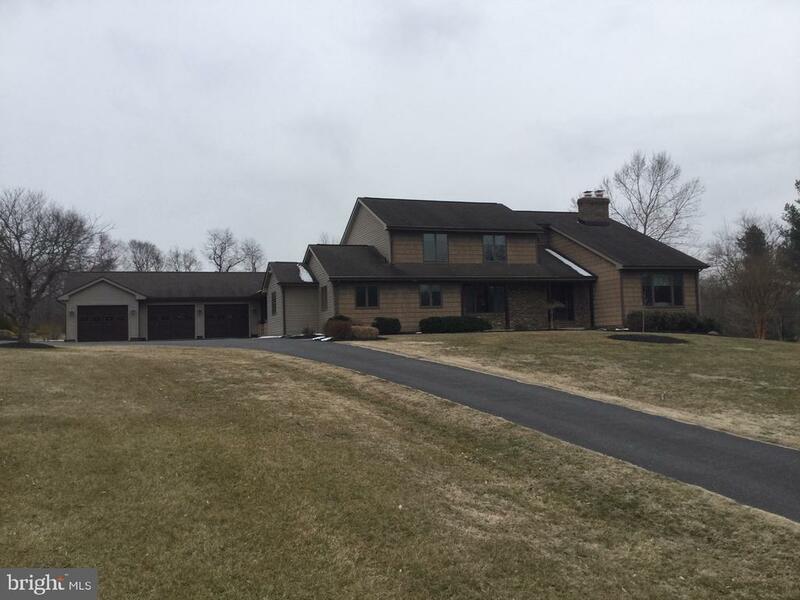 All Middletown homes currently listed for sale in Middletown as of 04/20/2019 are shown below. You can change the search criteria at any time by pressing the 'Change Search' button below. If you have any questions or you would like more information about any Middletown homes for sale or other Middletown real estate, please contact us and one of our knowledgeable Middletown REALTORS® would be pleased to assist you. 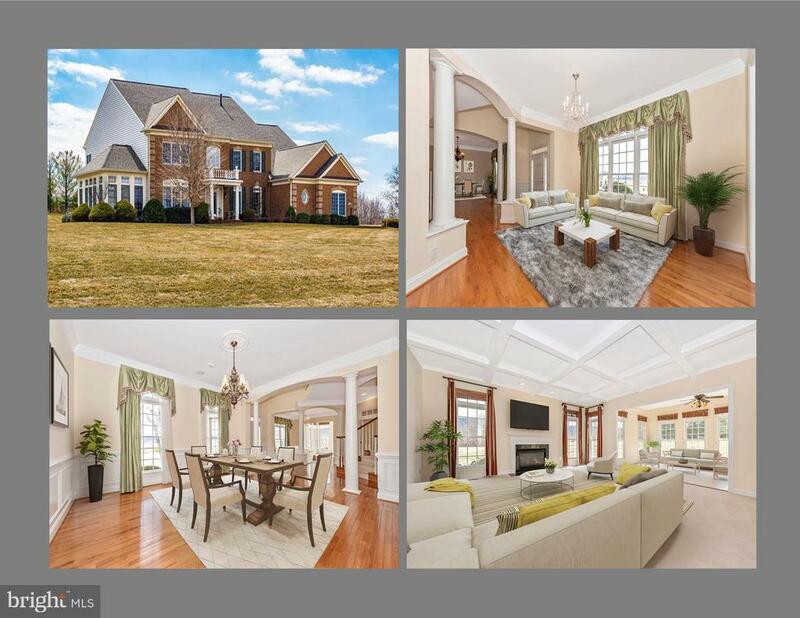 "Expansive estate situated on 16 park like acres in the beautiful countryside of Middletown. Bright, open floor plan with 21' vaulted ceilings and two level glass block wall at stairwell. Ceramic tile floors in kitchen, dining room, bedrooms and baths with blue stone floors in living room. Kitchen boasts Subzero refrigerator, gas Viking stove and granite countertops. Main level master leads to spa like bath with walk in closets, over size jet tub and sauna. Wine cellar in basement. New hot water heater and AC unit. Over sized two garage with finished studio/bedroom with full bath and new flooring. Enjoy outdoor cooking with brick BBQ and wood pizza oven. Huge bank barn with electric has new roof and upper exterior. Bring your horses to graze on expansive pastures with stream. Truly a unique property with nature abound!!" 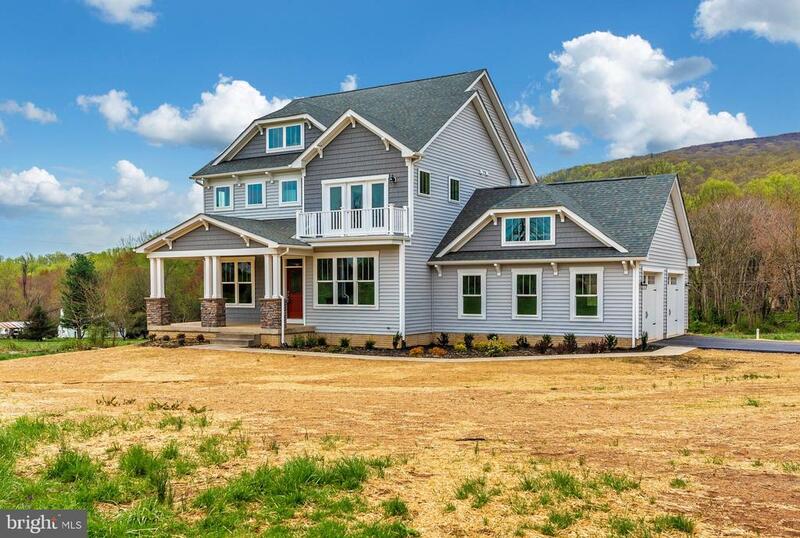 "Prepare to fall in love with this stunning 5 bedroom 4 1/2 bathroom home in the highly desirable Vistas at Springdale! Driving up you'll be in awe of the gorgeous exteriors, as this home has great curb appeal. Walking in you'll find a two-story foyer leading to your formal dining room and formal living room. You'll then fall in love with the amazing sun room and executive office suite. Enjoy the ample light with palladium windows in your spacious family room with gas fireplace. Then walk into your stunning kitchen with large island, built-in desk, breakfast area, and butler's station. Upstairs you'll find an amazing master suite with wet-bar, private sitting area, private deck, large bedroom space, master bath, and dual walk-in closets. Plus on the upper level you'll have a secondary master, two additional bedrooms with Jack-and-Jill bathroom access, and your upper level laundry. Next you'll walk into the basement that has it all! A large rec space, sitting area with fireplace, wet-bar, full bath, bedroom with walk-out, and an amazing home theater! Add a 3 car garage, gorgeous deck and patio, and this home really does check every box. Don't miss out on making this amazing house your next home! See our virtual tour here: https://my.matterport.com/show/?m=ahrGeEXWE1R&mls=1"
"NEW PRICE! -- Huge & beautiful w/great views & next to golfing! Built by Equity Homes & offering gorgeous mountain & golf course views, this home is unparalleled and uncompromising in quality. Offering approx. 6,482 finished square feet & 1,114 unfinished square feet, every square inch is perfection & so beautiful throughout, you won't want to leave. Main level features include 10' ceilings & gorgeous Brazilian Cherry hardwood floors. Additional main level amenities include a grand 2-story entry foyer with curved staircase, a formal living room, and a huge formal dining room with decorative columns, crown molding, ornamental wainscoting and chair rail. The main level also offers a large office with French doors and decorative window transoms. The grand family room is adorned with a wall of windows letting in lots of light and offering a beautiful view, a coffered ceiling, beautiful gas fireplace with custom built-in shelves on either side, and exquisite 100% New Zealand Wool carpet. The gourmet chef kitchen looks into the family room and the sun room addition. Truly a chef's dream, the kitchen offers a GE Monogram gas cook top range with six burners, a GE Monogram range hood with warming shelf/light, GE Monogram Advantium/Microwave oven, a built-in wall oven, gorgeous 42 inch Cherry cabinets, large center island with bar sink, beautiful granite, large walk-in pantry, and a reverse osmosis filtration system in the kitchen. The large sun room off the kitchen offers beautiful views from the back side of the house and an exterior door to the large covered and open patio. The laundry room is also located on the main level as well as a powder room.The second level boasts 9' ceilings and can be accessed by two staircases. Escape to the luxurious master suite which offers a bay window effect on the exterior back wall, beautiful window treatments, a marbled gas fireplace with custom built-in shelves on either side, tray ceiling, sitting area, two large walk-in c"
"AUTHENTIC*ORIGINAL*SUSTAINABLE - Perfectly captions this Middletown Valley Home. Beautifully Sited on 3.57 Acres Framed by Distant Mountains & Meadows, Its Simply a Home to Treasure.It Features 4 or 5 Bedrooms, 5 1/2 Baths, 2 Fireplaces, HVAC Designed with 3 Separate Systems w/6 zones of Control, Heated Gunite Pool with Brick Paver Surround, Audio Surround & Security Systems and Red Birch Random Width Hardwood Floors. 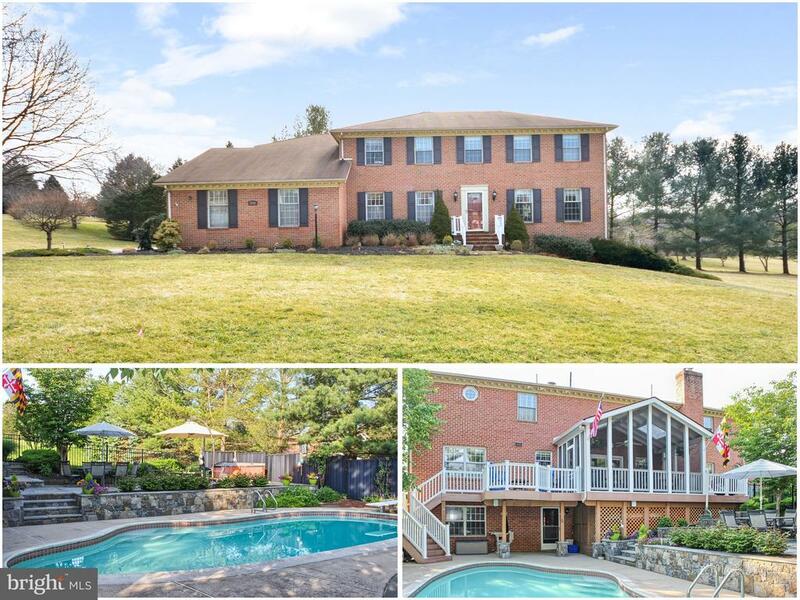 A Home of This Quality Located in a Maryland Blue Ribbon School District is rarely available. 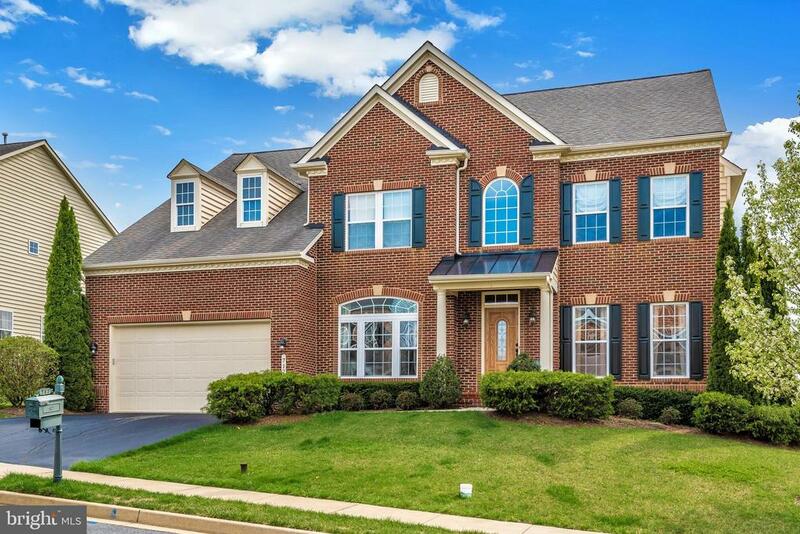 Commuters - Located 5 Minutes from I-70 and Just 15 Minutes to Frederick's Historic District. Perfect Home, Perfect Location & Perfectly Priced!" 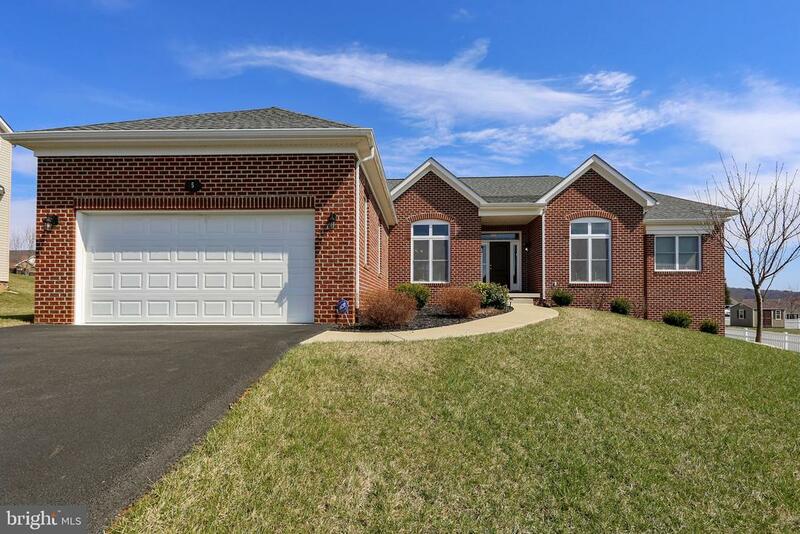 "Upgraded Immaculate & Pristine Residence Rests Majestically On A Slight Knoll Consisting Of Approximately 4 Acres Overlooking Maryland National Golf Course With Unobstructed Panoramic Views Of The Catoctin Mountains And Shows Like A Model ! Lavish Amenities & Extra's Throughout Includes Gourmet Kitchen, New S/S Appliances, Granite Counters, Prep Island, Double Ovens, Gas Cook Top, & Butlers Pantry Adjacent To Spacious Formal Dining Room. Stylish Interior With Both Formal & Casual Spaces. Extensive Millwork Includes Deep Crown Molding, Chair Rail, & Coffered Tray Ceilings. 1st Floor Main Level Includes Two Inviting Sun Filled Solariums, Private Library, Formal Living Room & Dining Room Plus Large 20X19 Family Room With Cozy Fire Place. Energy Efficient Vinyl Windows, 4 Zones HVAC, Dual Staircases To Upper Level That Includes 5 Bed Rooms 3 Of Which Have Private Full Baths. Large Owners Suite With Walk In Closet, Pvt Full Bath & Double Vanities. Oversized 61X21 Walk Out Lower Level Family/Rec Room, Work Out Exercise Alcove, Large 18X12 Office/Study & Or Potential Guest Suite With Full Bath. 3 Car Attached Garage, Extensive Exterior Hardscape, Approximately 5522 SQ/FT First Floor & Above Plus 2100 SQ/FT On The Walk Out Lower Level Provides Over 7000 SQ/FT Of Grandeur. New Roof Installed IN 2017 With Architectural Shingles, Newer HVAC Systems, Freshly Painted On Interior/Exterior, Newer H/W Floors Added & New Neutral Carpeting, Newer Water Filtration System, Excellent Well Report From FC Health Dept. Indicates 25 GPM Flow, & Central Vacum Throughout. Simply Detailed To Perfection !!" 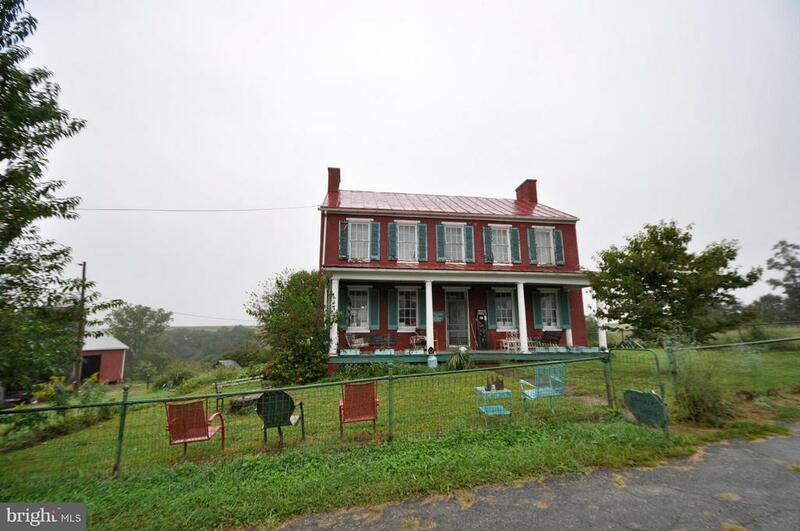 "Bucolic setting just outside of historic and highly desirable Middletown on almost 70 acres. Property conveys with a 4 bedroom main house, 1 bedroom guest cottage and 1 more building site. Up and running equestrian facility with center aisle barn, riding ring, oversized equipment and hay storage building, nine paddocks with water and electric plus multiple run-in sheds. The farm produces all it's own hay! The converted milking parlor is now a charming 1 bedroom guest house. Up on the knoll near the 2nd entrance is a 3rd building site with amazing mountain views. 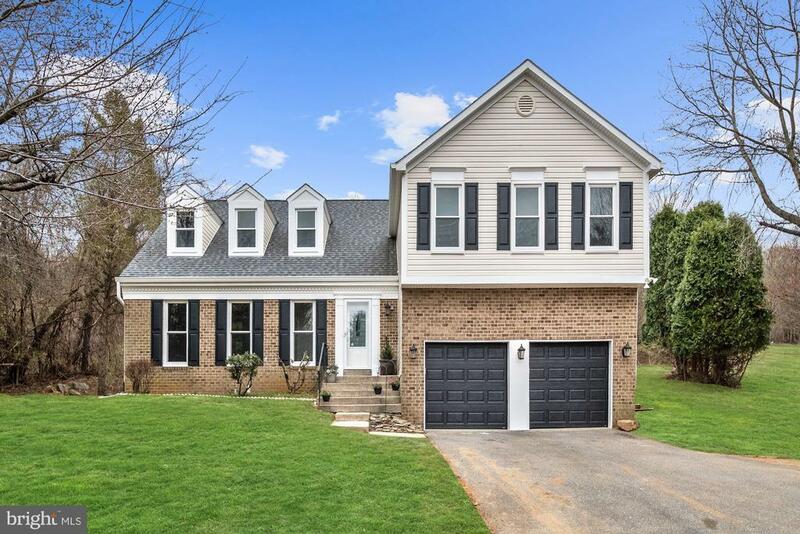 So close to MARC train, Virginia line, downtown Frederick and 270 via 70 you could be anywhere in no time at all yet live the quiet country life. Need help with the down payment? 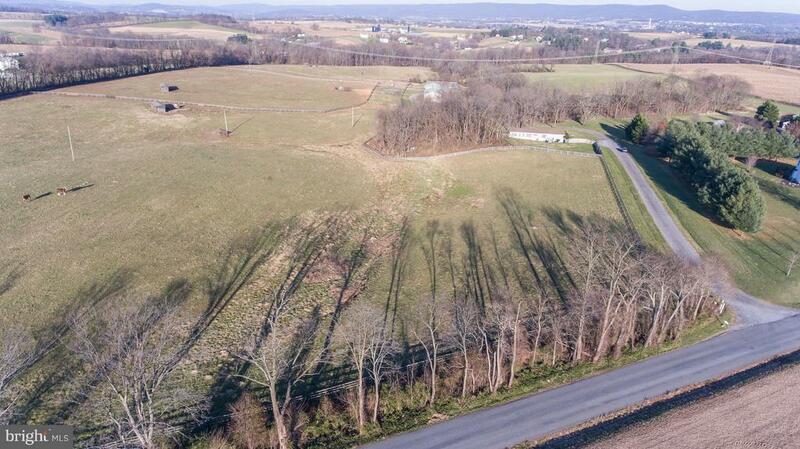 Ask about MARBIDCO"
"Operating farmette with main house & rentable tenant house(3BR), bank barn, dairy barn, lg loafing shed, lots of extra bldgs/barns, pasture, stream, about 3 tillable acres/8+ ac woods/8-10 acs pasture. Beautiful views and great location for fcarming market access." 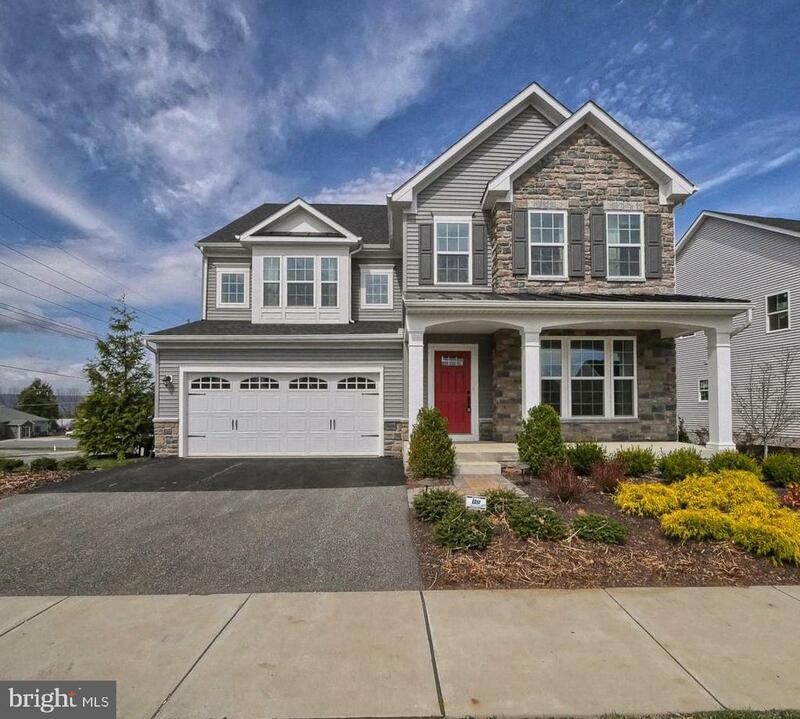 "FORMER MODEL HOME FOR RYAN HOMES IN MIDDLETOWN GLEN. PROPERTY HAS ONLY EVER BEEN USED AS MODEL AND HAS NEVER BEEN LIVED IN. LARGEST MODEL & HOME IN NEIGHBORHOOD. (TORINO MODEL) SEE FLOOR PLANS IN DOCUMENTS. OPEN FLOOR CONCEPT. OVER 5000 SQ FEET OF FINISHED LIVING SPACE. UPGRADED TRIM PACKAGE IN HOME. GOURMET KITCHEN WITH 11 FOOT ISLAND, GRANITE COUNTER TOPS, DOUBLE WALL OVENS, BUILT IN MICROWAVE. HUGE PANTRY OFF KITCHEN. BREAKFAST AREA AND SEPARATE FORMAL DINING ROOM. ALL STAINLESS STEEL APPLIANCES. GORGEOUS MOUNTAIN VIEWS FROM THE MAINTENANCE FREE DECK. EVERY FULL BATH IN HOME HAS CERAMIC SURROUND TILE. LARGE MASTER BEDROOM WITH 2 LARGE WALK IN CLOSETS. LOFT AREA ON UPPER LEVEL THAT COULD BE POTENTIAL BONUS ROOM/OFFICE/5TH BEDROOM. PROGRAMMABLE THERMOSTATS ACCESSED REMOTELY. SOUND SYSTEM THROUGHOUT ENTIRE HOME. SEPARATE LOWER LEVEL ENTRY. OFFICE/MEDIA ROOM/ REC ROOM & ADDITIONAL BEDROOM IF PARTITIONED IN LOWER LEVEL. TANKLESS WATER HEATER. BRICK PATIO UNDER DECK IN BACK YARD. ONLY 15 MINUTES FROM BRUNSWICK MARC TRAIN FOR THOSE COMMUTING INTO D.C. AREA. WALKING DISTANCE TO SCHOOLS, DOWNTOWN MIDDLETOWN AMENITIES. AND SO MUCH MORE!! COME AND VIEW THIS AMAZING PROPERTY AT OUR OPEN HOUSE SATURDAY & SUNDAY APRIL 27TH AND 28TH FROM 1-3PM." 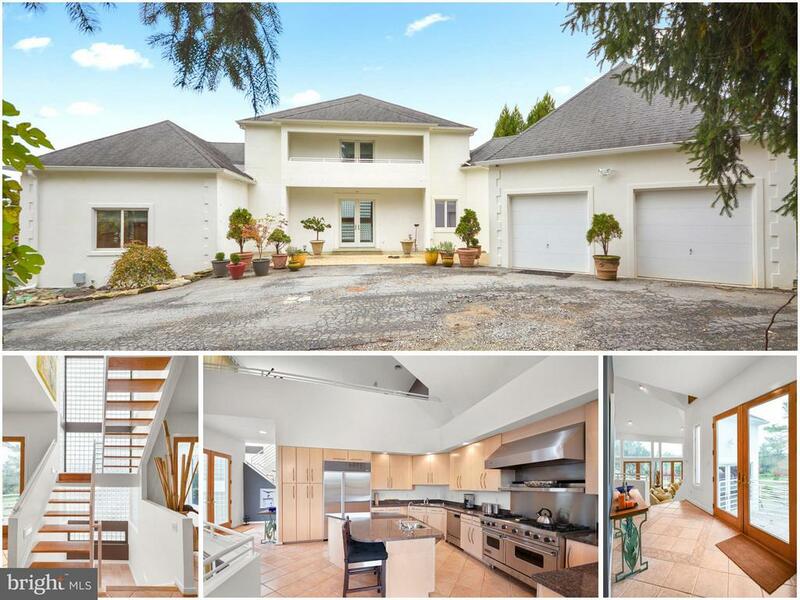 "CUSTOM-BUILT 5BR HOME WITH MASTER ON 1ST & 2ND LEVEL FOR IN-LAW/AU PAIR SUITE OR IDEAL HOME OFFICE. QUIET, PRIVATE CUL-DE-SAC IN MATURE NEIGHBORHOOD ON LANDSCAPED 3.23AC LOT. LARGE YARD FOR PLAY OR TO ADD POOL. UPDATED KITCHEN, ISLAND, BAR & GRANITE TOPS. UPDATED BATHROOMS, GRANITE, TILE, WHIRLPOOL, CERAMIC SINKS & TUB. NEW PAINT & CARPET, REFINISHED HARDWOOD FLOORS. 3 FIREPLACES, RELINED CHIMNEYS. WALK-OUT FINISHED BASEMENT, OFFICE, PLAYROOM/GYM, STORAGE. NEW WELL PUMP & HW HEATER & MORE"
"Welcome Home! 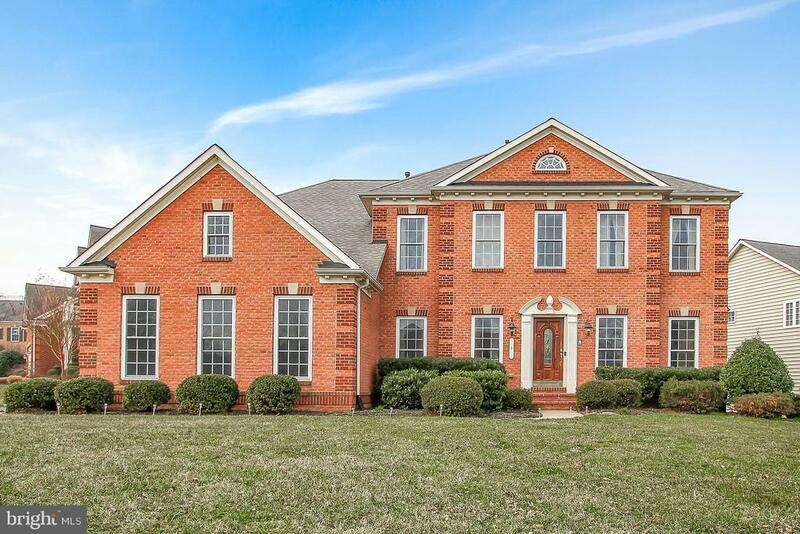 Standing out with notable curb appeal is an all brick Ausherman built colonial located in a very desired Middletown neighborhood on a premium corner 1.09 acre lot. Priced under a 2017 appraisal available for review. This home has everything to offer - location, community, over an acre of ground, a large & functional floor plan, finished walk out lower level, and amazing resort type amenities located in your own rear yard for your personal pleasure or entertaining needs. Renovated in 2006 with new wood floors, baths, kitchen with silestone, etc prior to sellers purchase of the home and many updates since . Fabulous floor plan features a large home office, formal living and dining rooms, a large kitchen with center island and breakfast area open to a spacious family room with a brick wood burning fireplace for cold evenings in, dual staircases, grand foyer, luxury master suite with large walk in closets, & master bath, 3 additional large bedrooms on the upper level share another large bath, the lower level features a large 5th bedroom with double closets, a recreation room, and a kitchenette - use as an in law suite in the walk out basement with a separate entrance or as added living space. A true gem awaits off the kitchen as you step onto the screened, covered trex porch and trex sun deck that overlook the rear yard - extensive hardscapes to include walls and patios , an inground pool , a hot tub, a hardscape fire pit, landscaping , and classic, aluminum black fencing. The sellers say they experience breathtaking sunsets from this outdoor paradise. But with over an acre, there is still plenty of ground left spread to out and invisible fencing for the dogs. Updates since purchase include a 2016 2 system 18 seer HVAC unit, updated hall bath, an upgrade to 400 AMP in 2007, attic insulation upgrade, 2008 upgrade to 80G HWH, 2018 new well pump and tank, new garage door, exterior eave paint, 2018 repaving of driveway, 2007 pool upgrades to"
"OPEN HOUSE, SATURDAY 20th, 12:00 to 3:00. This incredible move in ready home built by Glenix Homes has everything you have been looking for. Offering an open floor plan, morning room, main leave guest suite, dual staircases, gourmet kitchen, 21~x10~ covered front porch, huge mudroom, oversized 25x25 side load garage, 2nd bedroom suite with full bath and balcony and walk out basement this home is loaded. It doesn~t stop at the structural options though because the finishes are high end from top to bottom. Granite counters, white shaker cabinets, high end stainless appliances, wood floors, craftsman style trim, doors and railings, wood staircases, ceramic tile in all bathrooms and the laundry room, luxury master suite with huge shower, freestanding soaker tub, stone column bases, maintenance free exterior trim details, shake siding features, energy efficient windows and doors, upgrade TRANE HVAC and upgraded insulation package to name just a few. All of this on 1.70+ acres with a view.Buy this home today or have us build one for you on your lot of choice. We like to make the process of building your new home easy. We like to make the process of building your new home easy. That~s why all our option prices and colors selections are available on line. Call our sales associate to set up an account today." "Stunning with more than 4,300 square feet of perfectly proportioned living space above grade plus a finished basement! Large windows fill this home with beautiful natural lighting and views of the outdoors. The kitchen is a chef's dream - great counter space, plenty of storage in the 42-inch cabinets, 5-burner gas cooking, walk-in pantry, center island, butler's pantry and plenty of space to gather too! Dual staircases, designer molding package, dramatic 18-foot ceilings, convenient main level laundry, the corner office we dream of, and a floor plan that flows for easy living or entertaining. A perfect 10!The finished basement adds another 1,000+ square feet of bonus living space and was most recently used as an in-law suite complete with a full bath and chair lift. All this and more perfectly placed in the Glenbrook neighborhood, backing to the golf course and feeding into Middletown schools." "If you have been looking for luxury, then look no further than 16 Wagon Shed Lane. This home features 3 fully finished levels with 4 bedrooms on the upper level and 3.5 bathrooms. Walking down the stairs to the basement you enter your own private paradise, a mix between an upscale winery and a sports bar that includes a custom built bar and wine cellar. Did I mention your own private gym/work-out room? Plus afull bath with custom tile work and frameless shower that is perfect after a tough workout.Exotic hardwoods are features on all 3 levels. Freshly painted from top to bottom. Your first impression upon entering is one of grandeur. High ceilings, custom molding, dual staircase, your own private office. Not to mention the gourmet kitchen with all the bells and whistles.Upper level is just as impressive with 4 bedrooms including a large owners suite with dual closets and a spa-like bath." "Custom designed and built Rambler situated on an upward half acre lot which overlooks Middletown Valley and the Mountains nearby. Architectural Shingles, 2x6 STUD Grade Exterior Walls. 9' ceilings and Premium Hardwood Floor throughout the main level, Upgraded cabinets, and Appliances, Andersen 300 series Double Hung Tilt Windows, 13 Seers Heat Pump, Insulated Duct Work, High Energy Efficient Fiberglass Insulation, R-49 in Attic, R-21 House Walls, R-11 Blanket wall Insulation, Full unfinished Basement with Side Walk up Stairs. First Owner and 4 years young Custom Rambler/Ranch offers light filled sunny split bedrooms and open floor plan, 3/4 bedrooms, 2.5 bathrooms, 2378 square feet living area. Middletown Valley stretches between Catoctin Mountains on the east and the South Mountain to its west. The town reportedly gained its name from its location being midway to these ranges. Many Neighborhood Events are available at Middletown. Highly Regarded School District. Parks, Clubhouses, Golf Courses and many more. Make Middletown your next Living Destination. 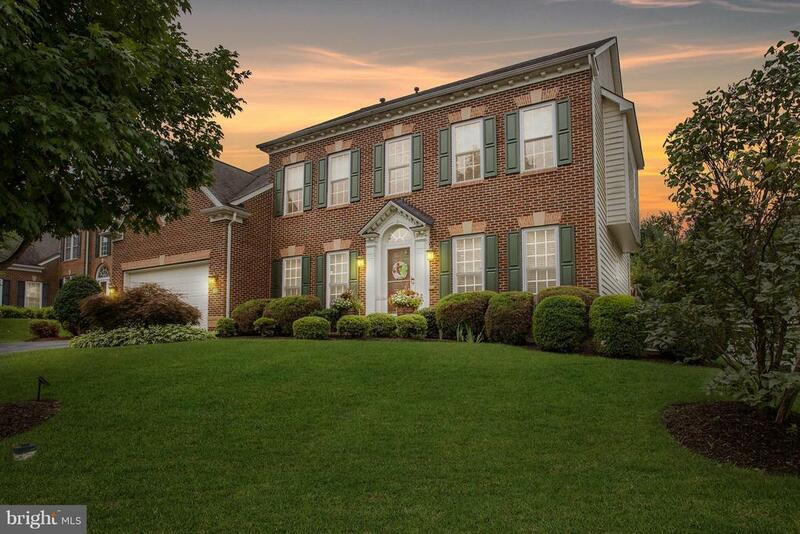 https://www.middletown.md.us/"
"Fabulous elegant Colonial on a premium lot backing to the 5th fairway. Majestic two story family room, gourmet kitchen overlooking sunroom addition. Handsome first floor library, Elegant owner's suite with sitting room, large walk-in closet and a fabulous luxury bath. The unfinished walk-up lower level is perfect for a handy person to setup a workshop or build out according to your dreams." "Welcome to golf course living in the Glenbrook community and its highly sought after Middletown schools. This beautiful home boasts four oversized bedrooms with three full bathrooms (including a Jack & Jill) plus a powder room on the main level with a dual staircase. The enormous master suite boasts his and hers sinks, his and hers closets, a sitting room, and trayed ceiling. The main level's open floor plan includes a living room, dining room, office (with a bay window), family room (with a fireplace), kitchen, and gorgeous morning room. The morning room has floor to ceiling windows that provide a breathtaking view of Middletown Valley. From the morning room you can walk out onto the second floor deck which also leads down to the fenced in back yard. Walk-in butler's pantry off the kitchen. Tons of crown molding. Mudroom off the garage. The huge heated basement is ready to be finished with plumbing rough ins for a bathroom." "NEW PRICE! The whole package! 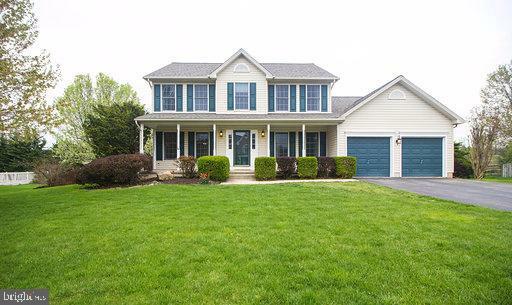 This charming Glenbrook colonial has it all - 3 finished levels including a walkout basement, gourmet kitchen, first floor office, and there's a gorgeous view as well! Double garage gives you so much space for cars and supplies. 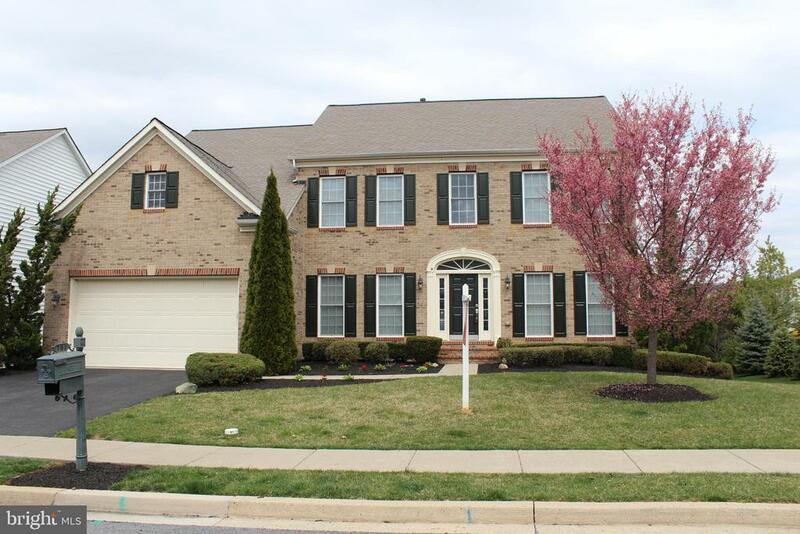 Beautiful 2 story foyer will entice with hardwood floors which continue through most of the main level! Sunny living room with bay area leads to your formal dining room with tray ceiling and crown and chair rail molding. Gourmet kitchen gives you beautiful cabinets, granite counters, 2 level island, double ovens, 5 burner cooktop, and an amazing view from the double kitchen window. French door leads from breakfast area to spacious deck overlooking fenced back yard. Gathering room with builtins calls you to relax, and there's even a first floor office! Head up the lush carpeted stairs to the catwalk overlooking the foyer, then head to the owner's suite with tray ceiling, huge walk-in and super bath. There's also another bedroom with private bath, two bedrooms that share a third jack and jill bath, and a large laundry room with storage. Lower level will give you a beautiful bedroom with walkout to yard, large rec room, storage area and another full bath! This one has it all!" 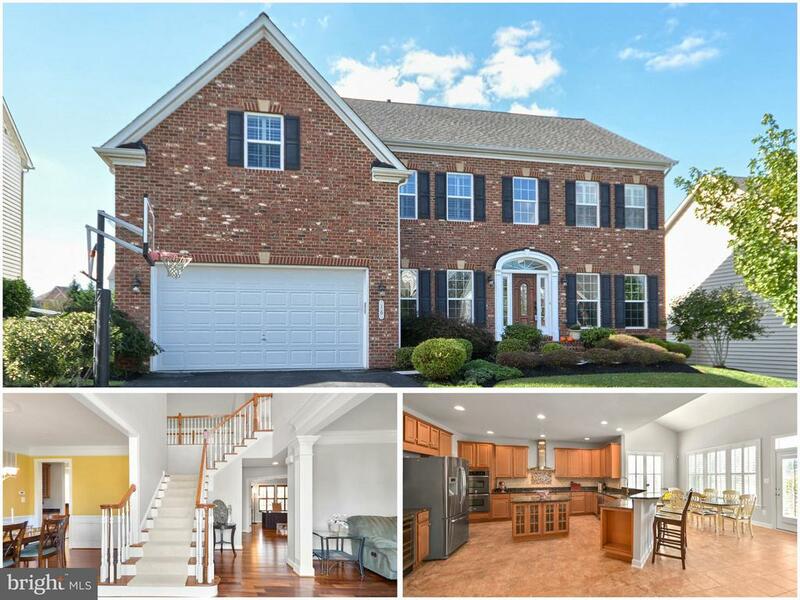 "This immaculate 4 bedroom (large room in basement currently used as 5th bedroom), 3.5 bathroom Colonial features breathtaking 2-story foyer, open floor plan, and 4,000+ finished SF, this home has so much to offer! The stunning kitchen boasts an island, granite counter tops, updated appliances, beautiful new back-splash, double ovens, gas cook-top, eat-in area/bump out, which leads out to a gorgeous deck that is perfect for entertaining! The family room is right off the kitchen and features a cozy stone fire place. Other rooms include a formal dining room with tray ceiling, formal living room/sitting room, an office, and a huge sun-room with tray ceiling. The large master suite showcases a full bathroom with walk-in shower, soaking tub, and dual vanities. Upstairs you will also find three other beautiful bedrooms and a laundry room. The lower-level features the 5th bedroom, full bathroom, wet bar, large rec room/den, and an unfinished storage room, which could also be an excellent workshop! Additionally, dual-french doors walk out to a gorgeous patio and back yard. Other features include lots of natural light, and hardwood & tile floors throughout. This home is close to restaurants, commuter routes, and a golf course. You don't want to miss this! ***PRICE REDUCED***"
"TO BE BUILT-Beautiful new subdivision of upscale custom homes. Homes include many features such as wood floors, granite counters, tile baths, etc. 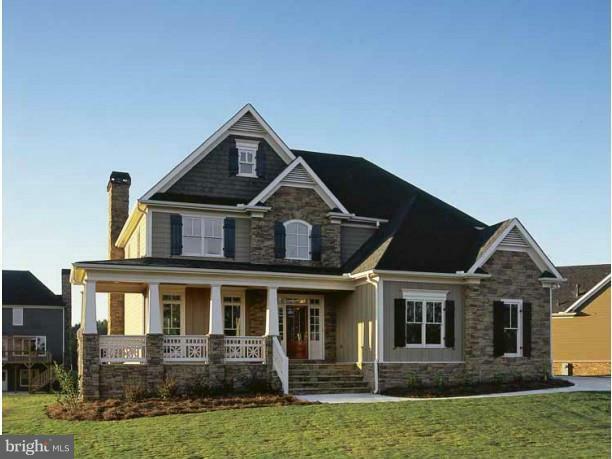 Each home will be different-Stone or brick accents-all lots 1-4+acres 8 total lots, Middletown Schools-Other floorplans available see listing agent-*photo likeness only-actual home based on options selected at contract." 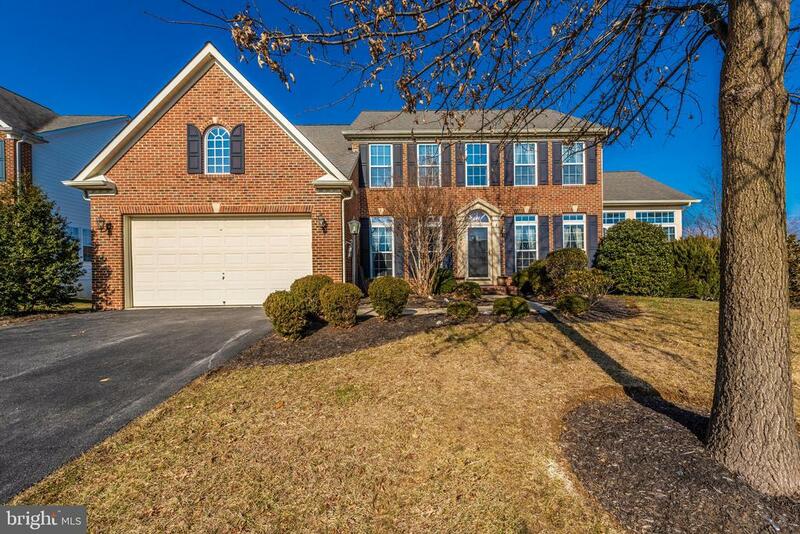 "This beautiful, huge home in Middletown has it all! 4933 sq. ft. of living space plus an additional 2475 sq. ft. in the basement, located on .46 acres. 2 story ceilings and gas fireplace in great room, morning room off kitchen, study, sunroom and formal dining room with tray ceilings. Kitchen has tons of maple cabinets, granite counters, ceramic tile floor, gas cooktop on island and butlers pantry. All bedrooms have direct access to a bathroom. Master bedroom has tray ceilings, sitting room, 2 walk-in closets, luxury master bathroom with soaking tub, separate shower, and dual vanities. 2 decks, a patio and fully fenced back yard. No HOA!" 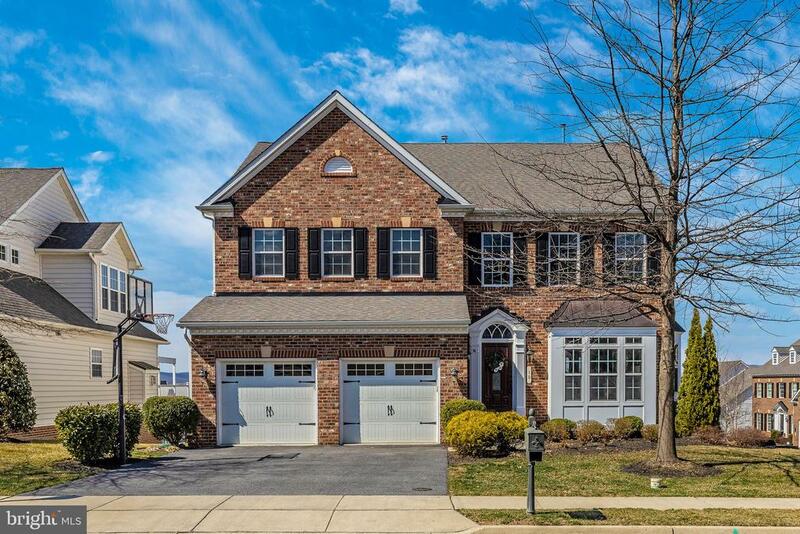 "Here's your chance to live in the sought-after Glenbrook Community in Middletown MD! 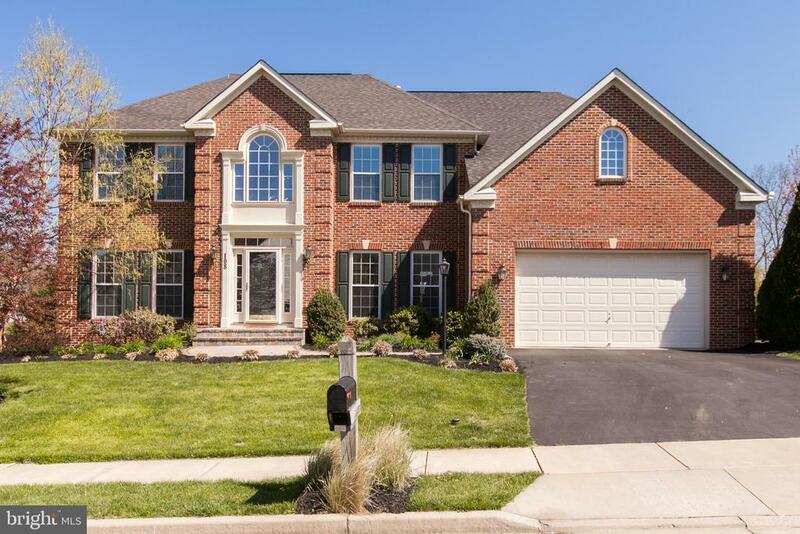 Being located on a corner lot with a side entry garage makes this elegant colonial even more impressive. Some of the features include a new electric car charging station, gourmet kitchen with morning room, tray ceilings, and beautiful stone fireplace. The focus of Glenbrook's community life is the Richland Golf Club which includes a clubhouse, sports bar & restaurant, and complete practice facilities. A home warranty is provided." "You'll love this stunning updated Colonial located in Foxfield, walking distance to the community park and school! Step inside this beautiful home, loaded with recent updates. 4 bedrooms, 2.5 bathrooms, 2 car garage, newer roof and HVAC, granite counters and stainless-steel appliances. A large entry foyer, cathedral ceiling and wood burning FP in the family room, gas FP in the living room, formal dining room and an office/study on the main level. The basement offers a spacious rec-room and play area. A large master suite with a huge walk-in closet & master bathroom. The kitchen opens to a spacious, covered screened deck overlooking the sparkling in-ground pool. Enjoy your fenced backyard with 2 additional decks, just in time for summer fun! Walking distance to the community park and school...this home has it all! Why are you still reading this? CALL NOW!" "Amazing recently renovated colonial style home boasting sundrenched windows, strong moldings throughout, gleaming hardwood floors, and stunning design-inspired features! Spacious living and dining rooms. The eat-in kitchen is complemented with ample cabinetry, sleek stainless steel appliances, beverage cooler, upgraded countertops, an island, and a breakfast bar. The sunken family room is conveniently situated off of the eat-in kitchen highlighted by a brick profile fireplace and built -in cabinetry. The master suite presents two walk-in closets, a sitting room, and a luxurious master bath. Three generously sized bedrooms, a full bath, and laundry room complete the upper-level sleeping quarters. The lower level includes a recreation room, a powder room, and storage. Exterior features include landscaped grounds, deck, private lot, and backs to trees. A MUST SEE!" 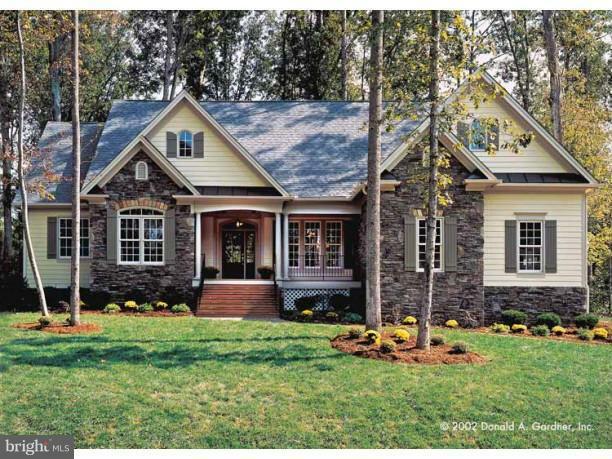 "TO BE BUILT-Beautiful new subdivision of upscale custom homes in Middletown. 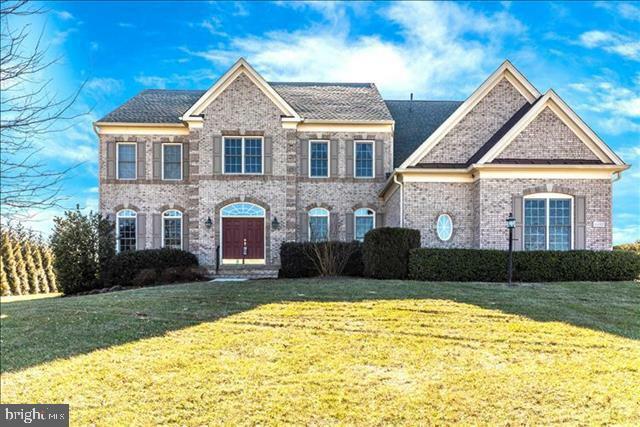 Homes include many features such as hardwood, granite, tile, trim, etc Each home unique with stone or brick accents.8 total homes on lots 1-4 acres. Middletown schools! Other floorplans available-call for an appt. photo likeness only-*actual home based on options selected at contract."